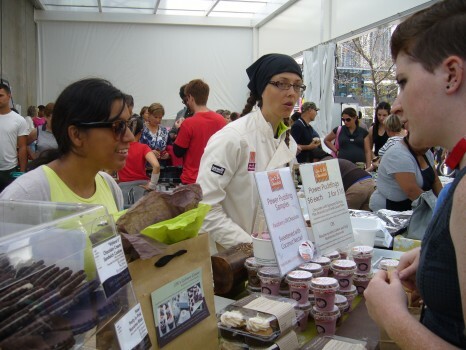 This past Sunday we went to the 28th Vegetarian Food Festival at Harbourfront Centre. 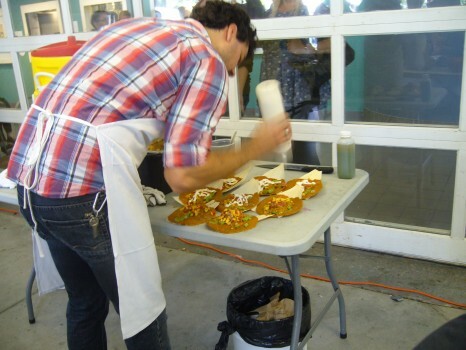 Hosted by the Toronto Vegetarian Association, it’s billed as the largest vegetarian festival in the world! 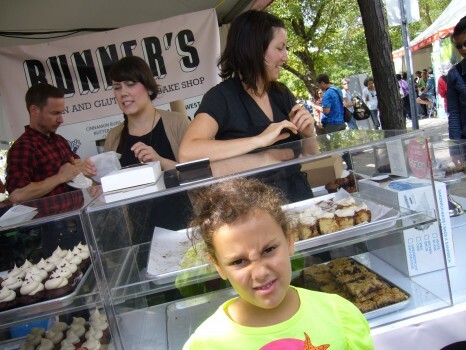 We went in search of some gluten-free goodness. Lily brought along her business card. 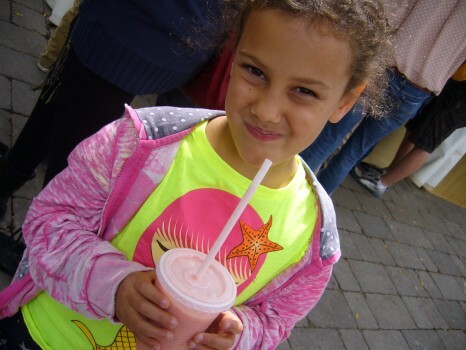 We started things off with a strawberry, banana and pineapple smoothie. 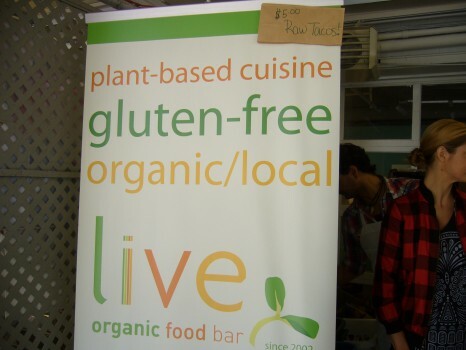 Next stop: lunch at Live Organic Food Bar‘s booth. We came for, what else, the raw tacos. Have taco, will travel! Raw, fresh and full of flavour. 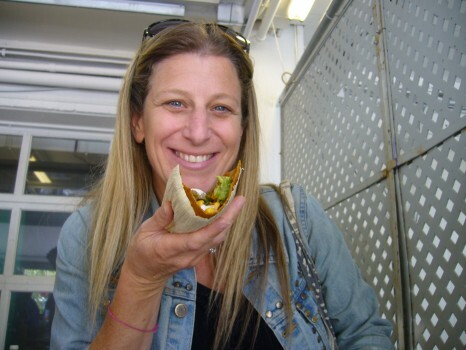 Co-owner of Live and raw food pioneer Jennifer Italiano flashes a smile. 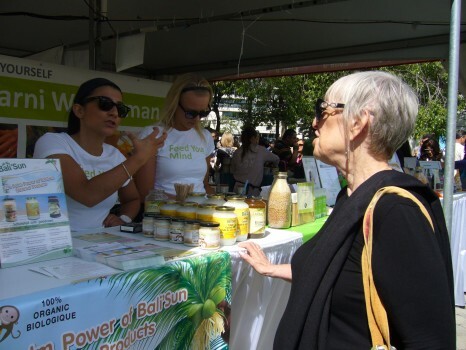 Buddy gets the lowdown on the many uses of coconut oil from the enthusiastic staff at Marni Wasserman’s Delicious Knowledge booth. 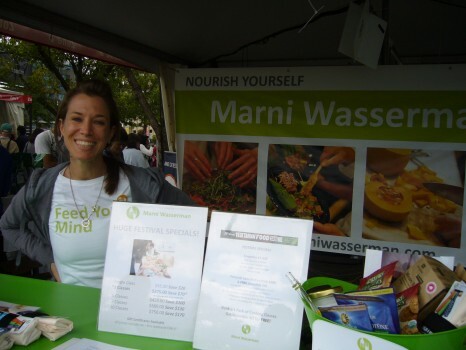 Culinary nutritionist Marni Wasserman wants to feed your mind (and tummy)! Most of her cooking classes are gluten free. I’ve been to a couple (it’s a great date night! ), and not only is the food indeed delicious, I also learned a lot from her. 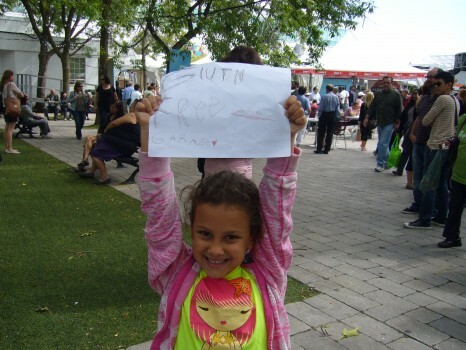 Check out Marni’s blog for some healthy inspiration. I’m thinking, look at those cinnamon buns! She’s thinking, not another photo! I happily surrender the camera. 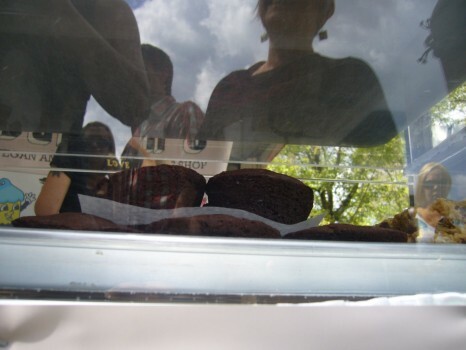 Lily set her sights on her favourite Bunner’s brownies. 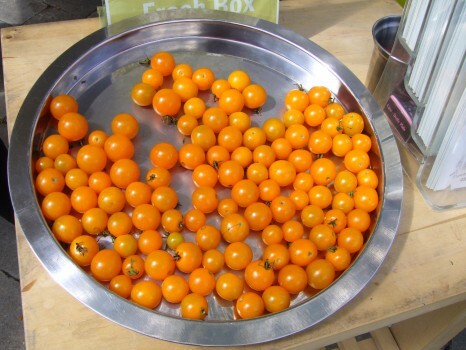 The sweetest cherry tomatoes from organic home delivery service Front Door Organics. Check out their impressive list of gluten-free products! Our next destination for some groovy GF goodies: LPK’s. 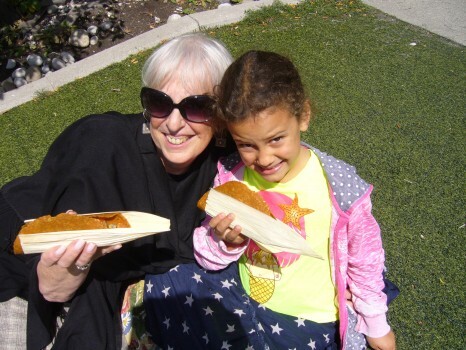 Mama wants some warm sweet potato donut holes! 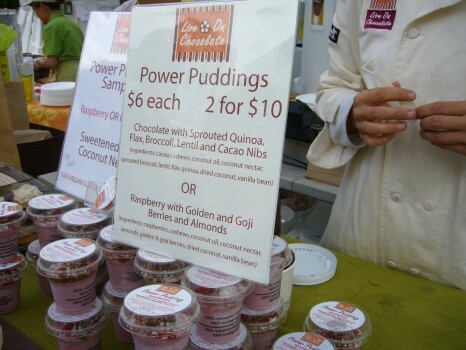 Here we also got to sample some yummy chocolate Power Pudding from Live on Chocolate (yes, we could). Bet you never ate pudding made from quinoa, sprouted broccoli and lentils! 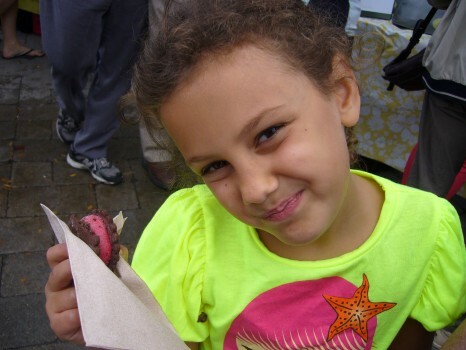 Lily got all pinkalicious with a raspberry ice-cream sandwich from LPK’s Culinary Groove. Salted caramel peanut butter. You heard me. 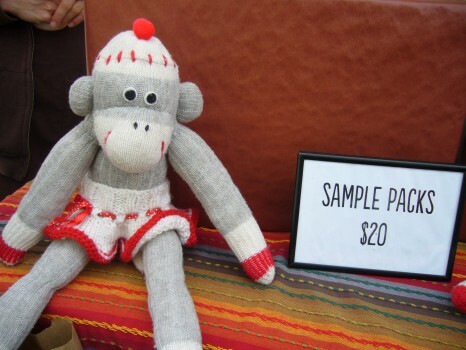 At the Monkey Butter booth I went nuts. It was between that and the dark chocolate banana peanut butter, so I bought both. Lily’s not a PB fan, but her little sister Franny will be licking the spoon clean. 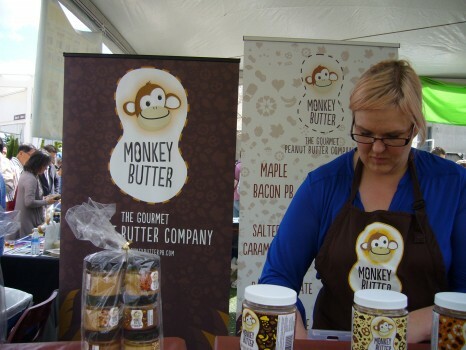 All the Monkey Butter flavours except one (white chocolate pretzel) are gluten free! 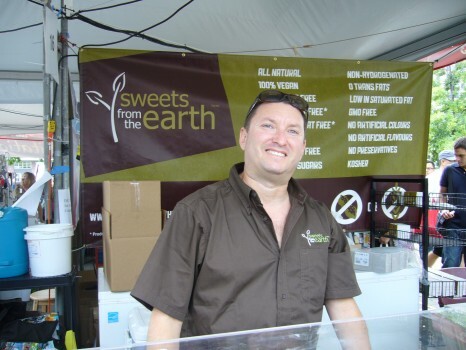 We saved Sweets from the Earth for our last stop, where we met owner Marc Kadonoff. 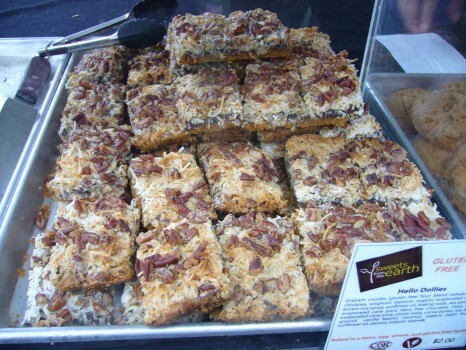 They have a dedicated gluten-free bakery! 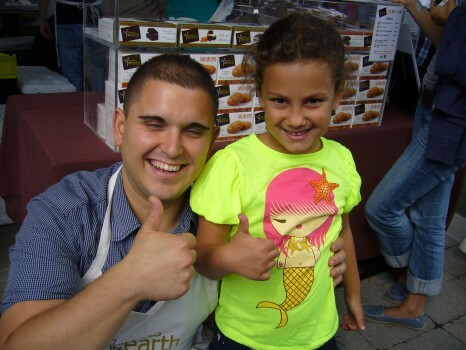 Sweets from the Earth teamed up with chef Doug McNish to create these gluten-free chewy almond fudge cookies that they launched at the festival. Check out the chocolatey fudge centre! 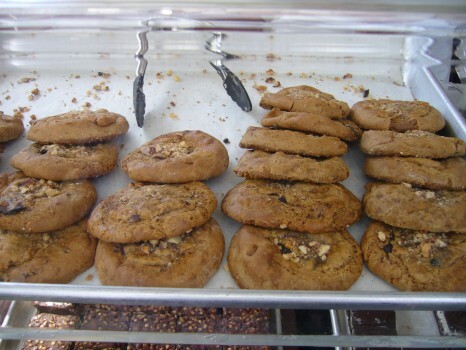 Eager to Name The Cookie, we filled out a ballot. 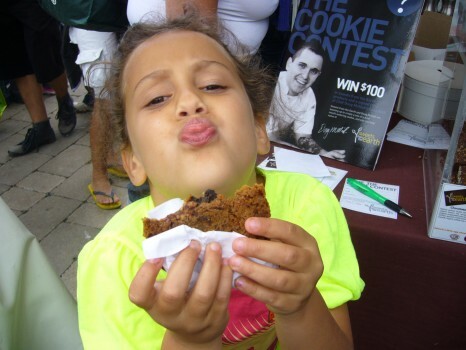 Thumbs up for the “luscious Lily cookie”! 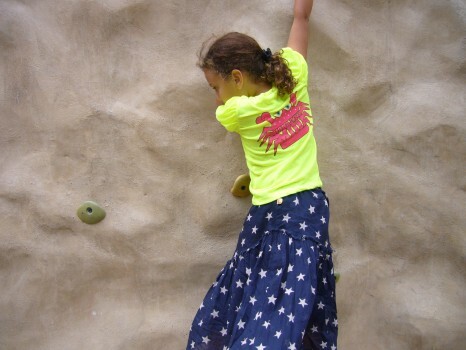 Filled with tummy love, we headed to the park and Lily climbed as high as she could. Posted in GFG exhibitor!, Happiness is..., Lily's corner, Products we ❤, Stores we ❤, Tummy love.